1930's Stained Glass Front Door with frame and sidepanels . 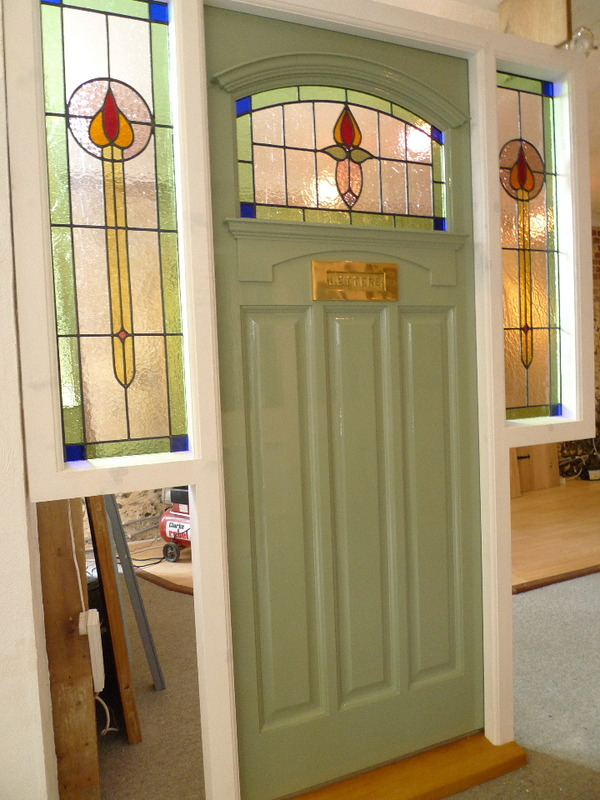 This door has been painted litchen green and has a brass letters letterplate fitted . These doors are available in either "engineered hardwood "or "engineered oak". 34 x 82 x 1 3/4 inches. and are excluding door furniture and painting . We can apply a clear sealer or white primer to the internal surface @ £42.00 inc vat , this can be left as is or can be over painted varnished or waxed as required. These doors are manufactured using LVL (Laminated Veneered Lumber). LVL or more commonly known as engineered timber is a modern method of construction that is economical with the use of natural timber resources. The main parts & rails of the door are usually constructed using solid strips/blocks of timber , which are then glued and then clamped together. They are then faced with a veneer and edged with a solid timber lipping. The benefits of using engineered construction doors over more traditional methods are; The door has a much more uniform look (no mismatched colours/panels, everything matches), It is far more unlikely to twist, split (we do not get problems with panels splitting) and possibly the most important reason is that it is much more Eco friendly!